On a consistently busy street in the Court Of Heroes neighborhood the Nightshade club advertises it’s existence with an elaborate turquoise, royal purple, and silver sign reading just the one word. However even from a distance, the music usually filters out when it’s open and makes the type of establishment clear. All patrons who come through the door know the statuesque redhead owner and proprietor as Nightshade. And if she has another name it is a closely guarded secret. She is usually found at her booth toward the back of the establishment. From there, she can watch the dance floor, the stage, the bar, the tables and booths for relaxing, and the entrance. And her reserved booth is also the closest to a group of rooms that are kept in the back for private meetings. The entrance to that hallway is always guarded by two security guards. Other security is stationed around the stage (to keep the performers safe) and at various other positions. They tolerate no shenanigans or violence, and anyone misbehaving or acting piggish is quickly escorted out. Nightshade herself is known for making business deals and taking numerous trips to one of the back rooms on any given evening. Much of her business is word of mouth, and she is reasonably well known for being available to discuss her work on most evenings. However, occasionally she does take a night off, though it is unknown where she goes. She’s a tall slender elven looking woman with scarlet red curls. She’s quite beautiful with almost impossibly flawless pale skin and amber colored eyes. She is friendly and alluring as she speaks, though often she seems a little too clever since she outwardly seems to be a beautiful porcelain doll. However it’s all part of her act to cause people to be calmer and more open around her. Nighshade Nightclub itself has a reputation for being a place of meeting and letting hair down for many of Ramsalon’s rich and influential citizens. It is not uncommon to see paperwork and official documents signed after a few of their signature Lilac Dream cocktails. Every night they have music and entertainment, and the venue is available for private events (though at a steep fee if the entire place is rented for the whole night). One of the reclaimed Orbital Derelicts Halo now functions as a small habitat almost exclusively for the psionically active. The remaining intact sections have been sealed and repowered with most of the amenities of the larger stations - remixers, plumbing, a rec area to keep fit in the gravity-free space, etc. There is sadly no holoroom, park or reservoir able to be used as a pool, so residents have to rely on other means of entertaining themselves. The Treatise Body governs and supplies Halo, but leaves immediate oversight to a council of its residents. Policing is internal, and council membership is voted on annually. The only stipulation from the Treatise Body is that the derelict not be armed or equipped with engines sufficient to move it more than required for orbital corrections. In its day, the ship Halo once was appears to have been primarily a medical vessel, perhaps even an orbital hospital of sorts. The damage done to the vessel during the Cataclysm was extensive, and seems to have largely stemmed from a powerful blast from inside the ship itself; a bomb of some sort, or an overload of the power systems. Many see it as an oddly appropriate metaphor for the derelict’s current residents in the wake of the Inferno. Hobbled together from over a dozen failed orbital craft, Shrapnel City is built around a core of another wrecked derelict, although the majority of the patchwork station is modern tech flung into orbit to escape the Inferno. Operating independently, Shrapnel City is peopled almost exclusively by those who didn’t feel welcome either under the Treatise Body’s rule or in New Domai meaning largely those with dark pasts, outstanding warrants or other reasons to want to disappear off the official record. As a result, Shrapnel City is a lawless and unstable station ruled over by several different crime lords whose empires are regularly shifting, often violently. It also plays home to a prominent black market, smuggling and drug trade - anything to help people in orbit escape from the absence of hope that comes with floating in a rickety tin can in space. The largest independent settlement in orbit, New Domai is made up of a number of different groups from the planet united in one thing: that the Treatise Body should not govern all of humanity in space. The station itself is built out of a remarkably intact Zuxian derelict discovered at the L4 Sirian/Boros Legrange point. Having somehow suffered almost no structural damage during the Cataclysm, New Domai represents the largest complete piece of Zuxian technology to survive to the modern era. It also represents one of the only true threats to the powerhouses of the Southern Coalition Fleet the Extravia and Kalvania although both they and New Domai are functioning far shy of fleet readiness. Despite planetary differences, the Independents of New Domai have formed a new nation together in orbit, bridging previous cultural gaps. Ostensibly a republic built on notions of liberty, independence and exploration, New Domai functions under an organized militaristic regime formed in hopes of keeping order between old enemies and remaining ever ready for a suspected Treatise Body coup, believed imminent by many of the stations leaders. Notable locations are the firing range, holorooms (large enough to stage military combat drills), armory labs (where new tech and weapons are developed and tested), marketplace and theater. The relics of Zuxian vessels from before the Cataclysm, damaged and abandoned during the calamity. Plistein Brotherhood agents sabotaged the ships as part of the initial attack on high technology to prevent other Zuxians from spreading the ‘dangers’ of high technology to other worlds and repeating the process. The propulsion systems in all Orbital Derelicts are destroyed beyond repair. Most life support and power systems are disabled or damaged, but the infrastructure is still in place to restore them with relative ease. The artificial gravity and matter transfer systems are damaged beyond repair. Now the derelicts are open claims for any survivors willing and able to get key systems back online to make them livable in the long-term. Competition among those eager to be outside the watchful eye of the Treatise Body is fierce and often violent. With the return of the Southern Coalition Fleet and the four thousand refugees from the Gargorian homeworld, the Gargorian Colonists have been going through some tumultuous cultural changes. Their strongest generation was born on Sirian Planet and knows their homeworld and its traditions only second-hand - the sudden influx of those desperately clinging to those traditions after watching their planet be overrun is causing a lot of friction among them. In hopes of holding the last of the Gargorians together socially, the Gargorian leadership leveraged the knowledge of the homeworlders to repair and relaunch the crashed colony ship (with a healthy amount of Zuxian patchwork they’d gathered over the decades). The new “frankenvessel” is not deep-space-worthy, but it is a serviceable long-term orbital habitat, and will give many Gargorians shelter and isolation from the Sirian Humans to allow for a period of healing and the reconstruction of a shared political and cultural identity. 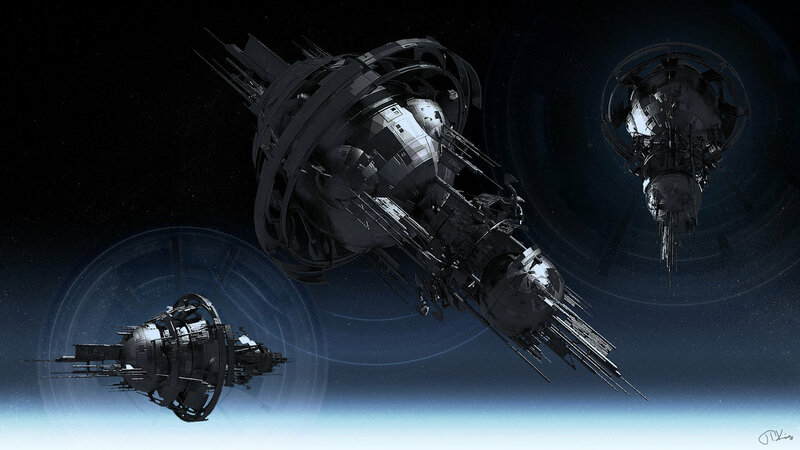 The station is much smaller than Station Prime and has a capacity of roughly 10,000 people living comfortably. The smaller size also means that it lacks the means to feasibly synthesize gravity through significant rotational force, so the entire station is a zero-G environment. The Gargorians combat the dangers of long-term zero-G living through medicine and regimented exercise, along with a slight boost from the harvested Zuxian technology that makes up roughly a quarter of the ship and its systems. The particular atmospheric filtering and farming setup on Gargorian Station utilizes many homeworld flora and fungi, along with the bioluminescent bacteria that naturally grows on them, giving the hydroponics installation a familiar glow for those missing home - or those who have never set foot on it. The space doubles as both the lifeblood of the station’s closed environment and as a public venue for spiritual and psychological renewal and healing. To encourage the regular exercise needed to maintain healthy living aboard a zero-G station, the Gargorians have a pair of dedicated holorooms specifically designed for a variety of exercise options to accommodate a variety of ability levels. These rooms have also been linked to the station network to allow for shared experiences with other holorooms, like those on Station Prime, if the users desire. It’s extremely common for those on their regimented exercise shift to engage in virtual reality online gaming with the neighboring holoroom or those on Station Prime as a way to exercise without really having to think of it as such. This has made Gargorian gamers somewhat notorious in certain types of hologames in a relatively short time. An entire section of the Gargorian station is dedicated to a variety of science and medicine laboratories for further advancement, development and study. The lab equipment is currently the most advanced in orbit, and collaboration with scientists and doctors from other Treatise Body nations is frequent. Station Prime is the largest station in low orbit above Sirian, the safest location off planet for humanity to live (at the moment). It is currently held under the joint authority of the various nations of Sirian, the Treatise Body. Commander Whit is the Station's administrator and operations coordinator. External security and asteroid patrol is handled by the security fighters of the Northern Republics Both reclaimed Zuxian vessels of the Southern Coalition Fleet are docked here. There are three major compartments of the station, each a bulky cylinder, connected end to end. Each component is spinning (two towards, one away). Additional structures jut from the thinner (not spinning) rods between each section of the station - most of them lead to solar panels, but some are docking points for ships of various sizes. Large cannons and turrets are in place between the cylinders, but the Station relies on a thick exterior and small fighter ships for defenses. In addition, off one end of the Station is a partially constructed fourth cylinder. This length of central rod is surrounded by scaffolding and the occasional tiny dot of movement: welders in space suits and drone workers. Partially protected under the curve of the in-construction exterior shell is a lit expanse of be thick semi-transparent plastic, stretched tight under internal pressure like a balloon. Movement on the other side of the plastic indicates additional life in that area. All four sections of the Station may be isolated from each other with multiple airlocks to minimize air loss or contamination in case of an emergency. All four sections also employ redundant power stations, basic water, sewage, and basic air supply handling. Section four remains under airlock access only, pending completion of construction. The Station sees a lot of ship traffic, small fighters and independent ships in orbit over Sirian, and is able to provide emergency assistance to other stations and ships. The station can safely house roughly 200,000 residents. Geographical Location: Hidden in the Diaur Thalor in the north section of the Ramsalon Forest on the Northern Peninsula. Climate: Winters are very harsh and brings large volumes of snow and ice along with the freezing temperatures. Spring and Summer seem to blend together as the area doesn’t get too sweltering, though floods can be a problem after a very heavy snow filled winter. There is a short Autumn season where the area gets cool and tends to be a bit stormy compared to the other seasons. The main way to reach Enyn Serin is by the Crossway, which is a bridge that connects the city and the Elven Outpost. Here non clan members are scanned before allowed crossing. It is also possible to reach the city by searching for it in the forest or from the sky, however those routes are a bit more treacherous thanks to the creatures that dwell in the forest. Enyn Serin has a bit of a unique to it as the older parts of the city is made up out of the materials that were the former homes of the founding families of the clan. When they had left the Rose Clan they had dismantled their homes to rebuild them where they would settle. This gives a lot of the older buildings a variation of colors, especially reds and greens, and similar to buildings of the Rose Clan design. Parts of the city that had been built since the founding make use of fallen trees from within the forest giving those buildings more golden colors, and the construction has changed slightly, more accommodating for the climate in the area. The city was first constructed a couple years before Kane founded Ramsalon. Having nowhere to take their people after the Lasaurus family lead those that would follow them to the Ramsalon Forest where they had found some intriguing ruins. At first it was to be a temporary settlement as their newfound clan got their bearings, but they came to love the area and starting scouting for a place to set up permanent residence. It was then they came across a grove of ancient and huge trees, calling it the Diaur Thalor. At first they started building their homes around the trees, however they suffered many setbacks from attacks from forest creatures attracted by the food and their first winter. The clan started to reconsider the location, one family that had rebuilt their home higher up in the trees suggested the others try the same. Some were skeptical, but many tried it. And it worked out. Since then the city has continued to be built up in the trees. In 2849 The Black Knights came to the forest and started recklessly digging up some of the ruins and taking up the resources. The clan tried to negotiate with the Knights, however no agreement could be reached so the clan and the Knights went to war. The Black Knights pushed the clan back to Enyn Serin, and laid siege to the city. All seemed lost, especially when a stalker prime appeared, however the Thalus brothers had found a couple of artifact swords. Believing them a gift from their god, the brothers helped turn the tide of the battle, defeating the Knights and saved the city though at a great cost. Then six months before the Darkest Night the Black Knights returned, lead by Gregory. They pushed to Enyn Serin after defeating the clan at the battle at what is now E’m Dorei. The Black Knights burned much of the city, closed off any escape to Frost Leaf and seemed to be on the verge of destroying the clan. Though heroes from the city of Ramsalon came to the aide of the clan and saved what remained of the city, once again defeating the Black Knights. The city was being rebuilding the destruction left by the Black Knights, though Ramsalon had gotten a lot of attention and some of their enemies had banded together to push against the Vaxian Empire Still recovering from the Black Knight’s assault the Wood Clan began increasing their magical protections around their city. The city was safe, but the damage and destruction being done by Whirler’s Automatons could not be ignored, and the Wood Clan joined forces with the Vaxian Empire. In 3013 Shi Inkahan declared war against the Vaxian Empire in order to make them pay for various atrocities the Vaxia Empire has done to their people, resulting in the Naga Nori War The Elven Alliance was warned of the incoming invasion and stayed out of it as it was a conflict between those two empires. However there was great concern as the Wood Clan had worked closely with the Vaxian Empire and it was unknown if any of the leadership of the clan was aware or willing participated in those atrocities. Thus the Elven Alliance Council declared Enyn Serin under martial law and locked it down to investigate the leaders of the Ramsalon Wood Clan. Trade was heavily regulated by the Elven Alliance, and hardly anyone could leave or come to the city. The trial concluded in the summer of 3016 with the removal of all the previous court and a new one was elected. The lockdown of the city was lifted. There are two levels to the city, the top level which is mostly housing built high up in the huge and ancient trees, and the bottom level which is on the ground level of the forest. There are a few mechanical and magical lifts that allow travel between the two levels, as well as a ramp down in four areas of the city. Aqueducts strategically frame the layout of the ground level and are built up to handle the plumbing and sewer needs of the city. There are a couple of stables and inns. Most of the buildings on this level house artisans such as blacksmiths, tinkerers, alchemists, or others whom trade tools are not great to have up in a tree. Next to the palace is the main military training barracks where all Wood Clan military and guards are trained and operate from. Crossway Plaza is where the Crossway exits into the city and is in the southwest section on the ground level. It is a small plaza where guards stationed to watch the traffic from the bridge. In the north corner of the plaza are some lifts which will take people to the upper level. The east side of the plaza is where wagons can go to be inspected and then directed where to go. The plaza also has a few benches to rest or wait for expected visitors. The plaza is designed to be easily locked down and separated from the rest of city in times of crisis. Crossway is a bridge built up across the forest that connects the Elven Outpost to Enyn Serin. It is mostly made out of enchanted stone and wood, to be quite studier and nearly unbreakable. The pillars that support the bridge are camouflaged to look like trees, and the bridge itself from underneath just looks like the tree canopy and has enchantments to further the illusion to keep it hidden. Any trees in the path of the bridge had been incorporated into its design. The bridge is wide enough to accommodate a moderate amount of traffic, and two wagons can fit side by side. There is a four-rope guard on each side that runs the length of the bridge. It is sometimes referred to as the Connector. Gatewalk Courtyard houses the Gatewalk portal that connects Enyn Serin to Frost Leaf is located in the northeastern section of the ground level of the city. The courtyard is in the shape of a circle with the Gatewalk in its center. The layout is designed to allow foot traffic to proceed through a checkpoint before being able to continue though, and there are lanes on the outer area of the courtyard for wagons to sit for a full inspection. The courtyard is designed to be easily locked down and separated from the rest of the city in times of crisis. Gatewalk is a simple gate almost appearing to be the shape of a G. It constantly has a blue mist around it. Runes mark the sides and the face of the gate, all down and along the bottom as well. Many of the buildings in the city are high up in the trees. Housing tends to be closer to the center of the city, and there are quite a few businesses mixed among them. The Treeway is the main path that winds around the upper level of the city. It is in a suspension style and is made out of wood and stone. Along the Treeway are many of the small houses that are built, as well as the social gathering places of the city. The Palace is located in the very center of the city and is the largest building to be found within its walls. It is also known as the Silver Palace for the protection enchantments upon it makes it look silvery. The palace starts built on the ground level and rises up towards the upper level, however the smaller top part of the palace is located on a floating island just above the tree line. The bottom half of the palace can be access from the entryways on the ground level and from the Treeway. In this part of the palace are rooms where visiting dignitaries stay. The largest room in this section is a cathedral area which is the main place for worshiping their god Elrund. The second largest room is the council room where various meetings are held. There is a balcony where the city can be addressed for formal announcements and to raise alarm in a crisis. The top part can be accessed via a portal room in the bottom part of the palace, or by the bridge that winds up to connect to it. The floating island is large to support the part of the palace. There are a couple of trees and grassy patches on the surface. There are large tunnel entrances that can be seen on the underside of the floating island. Those are a network of tunnels where the hangers for flying ships can be found. The rooms in the palace part on the island are mostly for military purposes, where lookouts are position to keep a vigil watch, strategy rooms for coordination and planning. Some of the rooms hold aviaries for the various trained birds from messenger, companion to war and hunting. There are also store rooms to hold some of the clans more powerful weapons.